- special info updates like interviews, video messages etc. - immediate entry to concerts in connection with a valid concert ticket (VIP Membership Entry) – no standing in lines anymore (only if possible and announced). REGISTER NOW FOR 3 YEARS - THIS IS A VERY SPECIAL OFFER!!! BONUS No. 1: THE FIRST and EVERY 100th, 200th, 300th etc. etc. fan registering will receive a VINTAGE SURPRISE PRESENT !!! BONUS No. 2: Those registering until the 31st of May 2009 will take part in a TOMBOLA which provides a total of 10 FREE ENTRY TICKETS (2 tickets per person) for one of the TD concerts in 2009 or 2010. 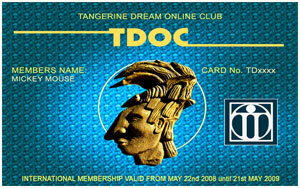 This card and its use is free of claim for compensation towards Tangerine Dream or Eastgate Music. The cardholder uses it to his own risk and is not allowed to transfer the card to other persons. PS: If you order the TDOC CARD you will get IMMEDIATE ONLINE access within 24 hours!! You don't have to wait for the postman...! PSPS: NO POSTAGE CHARGE FOR THIS ITEM!! THOSE WHO ALREADY HAD A CLUB CARD BEFORE AND LIKE TO PROLONG NOW DON'T HAVE TO REGISTER AGAIN - YOUR MEMBERSHIP JUST PROLONGS WITHIN A DAY, YOUR ACCESS DATA WILL BE THE SAME AND YOU WILL RECEIVE A NEW CARD SOON.